The 20th International Symposium on Correlation, Polarization and Ionization in Atomic and Molecular Collisions (COPIAMC) is an official satellite meeting of the 31st ICPEAC. COPIAMC will be held on the University campus in Metz (France) and will run over two and a half days, from the 1st to the 3rd of August, 2019. It will comprise both invited talks and a poster session. 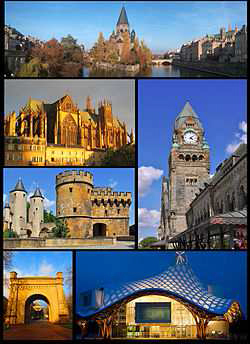 Metz can be reached in 1h 24min by fast train from Paris, and in about 5 hours from Deauville. Correlation and polarization effects in multiphoton ionization of atoms and molecules. Correlated motion in photodissociation processes. Coherence effects in multielectron excitation. "The International Symposium on (e,2e), Double Photo-ionization and Related Topics"
"The International Symposium on Polarization and Correlation in Electronic and Atomic Collisions". The most recent editions took place in Palm Cove (Australia, 2017), San Sebastian (Spain, 2015), Hefei (China, 2013), Dublin (Ireland, 2011), Lexington (USA, 2009). See also the History of the satellite.